According to Bohr’s complementarity principle, two distinct types of complementarity exist-one of complementary variables and other in the so-called wave-particle complementarity experiments. Some authors have claimed that mutual exclusiveness (ME) in both the cases arise due to uncertainty principle and have analysed the second type in terms of Fourier space analysis and consequent putative “momentum kick” distribution. Some others, on the other hand, have identified the collapse hypothesis as the actual quantum mechanical principle responsible for ME in the interferometry experiments. 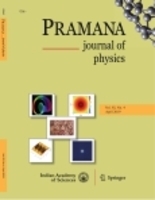 In this paper the momentum space analysis is thoroughly examined vis-a-vis the general quantum mechanical description in terms of the changes in the wave function. It is argued that such alternative explanations are not in full conformity with the strict quantum mechanical description. Effects of sintering on pore morphology and dielectric response have been investigated. Pore structure has been probed by small angle neutron scattering (SANS). It has been observed that the size distribution becomes less polydisperse with a slight modification in the distribution as sintering temperature is increased. Dielectric response in the frequency range 0.02–1000 kHz is significantly altered by modification of pore structure because of sintering. A transition from non-Debye type to near-Debye type response has been observed as the sintering temperature is increased. Nanocrystalline nickel oxide powders were calcined at 300, 600 and 900°C and pore structure evolution was followed by small angle neutron scattering (SANS). Pore size distributions at two widely separated size ranges have been revealed. Shrinkage of larger-sized pore with reduction in polydispersity has been observed with increasing heat treatment temperature. The pore structures at various heat treatment temperatures do not scale. This has been attributed to the grain boundary diffusion leading to an asymmetric shrinkage of the pores. Small angle neutron scattering (SANS) has been utilized to study the morphology of the multi-walled carbon nanotubes prepared by chemical vapour deposition of acetylene. The effects of various synthesis parameters like temperature, catalyst concentration and catalyst support on the size distribution of the nanotubes are investigated. Distribution of nanotube radii in two length scales has been observed. The number density of the smaller diameter tubes was found more in number compared to the bigger one for all the cases studied. No prominent scaling of the structure factor was observed for the different synthesis conditions. Mesoscopic density fluctuations in liquid phase sintered silicon carbide have been investigated using small angle neutron scattering (SANS). The increase in the additives results in the modification in the pore size distribution and to some extent the total porosity. SANS revealed a mass fractal nature of the agglomerated matrix microstructure. The fractal dimension of the matrix does not change appreciably with the additives although the upper cut-off value of the fractal decreases significantly with the increase in the additives. The liquid phase sintering due to the presence of additives helps to achieve higher level of densification. However, the agglomeration hinders achievement of the fully dense pellets. On the face of some recent experiments claiming the simultaneous presence of both `sharp interference' and `highly reliable which way information' and some others casting light on the origin of complementarity in quantum interferometric experiments, the whole issue is reviewed on the basis of our earlier precise formulation of Bohr's complementarity principle. It is pointed out that contradicting the principle (in this specific formulation) is impossible without contradicting quantum mechanics and a lack of general consensus regarding the origin of the mutual exclusiveness is at the root of the controversy and confusions.